Drivers who either deliberately or accidentally drive the wrong way on a city street, highway, or interstate pose an obvious danger to all other motorists. Because automobiles are heading directly toward one another at a high speed there is typically little or no time for drivers to react or avoid the collision. Wrong-way crashes are almost always head-on collisions that result in life-threatening injuries or even death for some accident victims. If you were injured or lost a loved one in wrong-way car accident, you may benefit from working with an attorney who has experience with wrong-way lawsuits and/or negotiating wrong-way accident settlements. To learn your legal options schedule a free legal consultation at 206-727-4000. Family members of a victim of a fatal wrong-way driving crash can seek financial compensation through a wrongful death action or lawsuit to help make up for the loss of their loved one. If the at-fault driver unintentionally goes the wrong way (because poor road design, confusing signs, lack of signage altogether) they can still be held accountable for the accident. 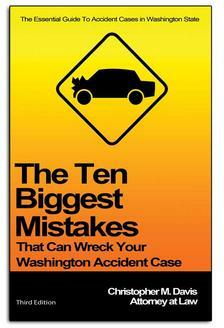 The city, county, or state responsible for road may also be held liable. The National Highway Traffic Safety Administration reports that wrong way drivers are involved in 1.5% of all fatal crashes. In King, Snohomish, Skagit, and Whatcom counties—136 wrong-way crashes between 1997 and 2000 resulted in 81 injuries and 9 fatalities. More than 50% of Washington State’s wrong-way accidents are caused by a drunk driver or a driver that was under the influence of drugs. On average about 350 people are killed each year nationwide in wrong-way freeway crashes, according to an analysis using the National Highway Traffic Safety Administration's Fatal Accident Reporting System.1,753 people died in wrong-way crashes on the Nation's freeways from 1996 through 2000. Thousands more are injured. A WSDOT study of wrong-way incidents on the stretch of road between Yakima and the Tri-Cities over a 10-year period showed that there were 30 wrong-way crashes, 11 of which involved a total of 15 fatalities and three serious injuries. The state focused on single portion of road in an effort to try to understand the causes of wrong-way accidents and develop workable countermeasures. The most frequent origin of wrong-way incidents is the freeway exit ramp (i.e., a driver travels the opposite direction on an exit ramp onto the freeway main lanes). Between 50% and 75% of wrong-way accidents involve a drunk driver who was under the influence of alcohol or drugs. The majority of wrong-way crashes occur in cities. Wrong-way crashes are more likely to happen during the early morning. Many wrong-way driving incidents originate at a “cloverleaf” or "partial cloverleaf" interchange where drivers become clearly confused. Motorists occasionally mistake an off-ramp for a frontage road located parallel to the ramp, and drivers can mistakenly turn left from the over-crossing street on to the off-ramp. Wrong-way movements can occur if the guide signing does not clearly indicate a safe route for the driver to enter and exit the freeway. Confusing “buttonhook ramps” are very susceptible to wrong-way movements. Interchanges with short sight distance at the decision point have a disproportionate number of wrong-way movements. These locations lack some of the visual cues, such as headlights of oncoming vehicles, that alert wrong-way drivers that they have made a mistake. There are no national-level programs to combat the wrong-way problem. However, many states have a wrong-way prevention programs that funds safety improvements. Several state’s departments of transportation have taken additional measures to improve ramp designs, signage, and striping to prevent wrong-way incidents. Other states are experimenting with intelligent transportation system technology to address the problem. Flashing red-yellow "Wrong Way" signs in critical areas. Concrete barriers that prevent drivers from entering roads from the wrong direction. Wrong-way warning system that combines video surveillance and directional movement detection. Electromagnetic sensors embedded in ramp pavement to detect wrong-way vehicles. Removing heavy vegetation that obscures views of interchanges. Increased lighting to improve vision at interchanges at night, the time when most wrong-way crashes occur. Separating on- and off-ramps to prevent confusion. Certain interchange design types tend to be more susceptible to wrong-way driving incidents than others—general improvements in design is needed.